Fit, but not a buffarillo. The picture shown is not her best one; personally, I like women with weapons (at least armed, non-crazy women). (1) She's a body builder and Instagram model. (2) Her curves are probably artificial but they are sufficient. (3) She's still completely crazy. No doubt she's trouble but Kiera(h) is an Anglicized version of Ciara, the name of a 7th-century saint, and means 'dark' or 'dark haired ' in Irish Gaelic. A bouncer choked out by a girl... something tells me this bouncer is the owners cousin. Could have caught him off guard. He's watching the door or the crowd, and she sneaks up and grabs him. He may be unwilling to throw her off, in fear of injuring her, maybe even thinking she's just pranking him, until it's too late. I could see it happening. A hit on the brachial plexus at the side of the neck can temporarily disable a victim, making resistance impossible. That may be why she was able to “choke him down”. Done hard enough it can also kill. I don’t go above a 10 on the crazy axis. Once a woman is above a 9, it doesn’t really matter how crazy she is. Big deal. We used to play the choking game all the time in the 40’s and 50’s. We are coming up on 50 posts and no one has asked you for an expert opinion. Laz? I’m thinking the bouncer was leery about striking the woman. Had a man been choking him, no doubt there would have been violence. Ive gotta say.....she looks not guilty to me. Bingo. That’s pretty much what the video showed. She puts her forearm against his throat and pulls back while he stands still, arms straight to his side. If the cops weren’t involved, it just looks like another prank-video to me. Of course, she’s applying for law school and stands by the story she was defending herself (from her twitter). 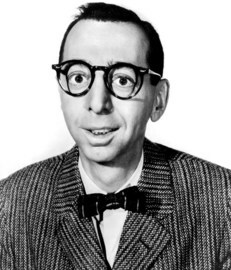 Believe it or not, Arnold Stang was a US Marine, and a WW II veteran. So he probably would have fared better than this bouncer did. And you folks under 60, here's who we're talking about. Wait a minute. Cancel my post #56. Stang was not in the Marines. i was thinking of someone else from that era (Eddie Firestone). Might wanna hire a competent bouncer next time. So they’re making a tougher breed of Plattsburgh sluts these days from when I was stationed there. What the hell kinda bouncer gets choked out by a girl? Someone my size, yeah. One of those 6’4” 300lb bouncers? I’d probably fire the guy.